Since I already drilled a nerve with What Newspapers Still Don’t Understand About The Web, which is on its way to becoming one of my most linked posts ever — and since everyone loves a sequel — I thought I would do a follow up for magazines. The lessons, of course, apply to every print publisher, who constantly discovers new ways to frustrate web users by prioritizing print over web. This time I’m going to pick on The Atlantic, which like the Washington Post is a publication I have a great deal of affection for (published by my former employer Atlantic Media), so this is not a general critique but rather a very specific example representative of a much larger industry-wide problem (i.e. I could find instances of the same problem on virtually any magazine website). It started this past Saturday when a friend (also a former Atlantic employee) emailed me asking me why I hadn’t mentioned my quote in the Atlantic’s latest cover story by Nick Carr. I responded saying I had no idea I had been quoted. I immediately when to TheAtlantic.com, where I discovered that the current issue was still the June issue, and that the July issue with Nick’s cover story still hadn’t been posted. This is a common practice among publishers who make early receipt of the new issue a benefit for print subscribers. But by doing that the publisher basically thumbs their nose at web readers and violates a fundamental principle of the digital age — if a user knows your content exists, but can’t access it, the result will be frustration or worse. The Atlantic already made a brave move by following NYTimes.com and removing their paid subscriber wall on the website. But still in this instance the print subscriber had access to content that, despite the power of the web, I couldn’t access. To make matter worse, I stopped by Borders on Sunday to see if they had the July issue — physically driving to a location to obtain content that already existed in digital form seemed ludicrous. But I was willing to pay for the print issue (and probably would have read more than Nick’s article once I had it in hand). Sadly, on the rack I found the June issue, just like on the website. I joked to my friend by email about the frustrations of being unable to access content in the digital age. He offered to fax over the article… or 8-track tape it. So I resigned myself to waiting for it to go up online, which I knew it would shortly. This afternoon, I saw on TechMeme a link to this CNET story about the Atlantic article. Great, I thought, it’s up online. Being a web user on a mission, as most are, I didn’t bother to read the sentence — I just clicked on the link and found the same June issue. This is ridiculous, I thought — here is a someone who has access to the article and wants to link to it, but can’t. And here I am, a consumer eager to read the article, and I can’t. Wall-to-wall frustration. But guess who stepped in to save the day… can you guess? Another print publisher trumped by Google. I clicked on the link in the email which took me to the article, which is in fact online. Actually, the whole July/August issue is online. It’s not linked on TheAtlantic.com homepage yet, as of this writing — and it’s not on the current issue page. But Google knows it’s there. Google knows everything. And most importantly, Google gives me what I want, even when print publishers, still trying to balance demands of two entirely different modes of publishing, choose to prioritize print over web. The web is Google’s first and only priority. That’s why they are beating the pants off of every legacy media company on the web. I found the section of the article where I was quoted, unbeknown to me, because Nick lifted it from one of my blog post. In fact, it’s in a section about bloggers who have commented on the issue at hand. But there’s no links to those posts. So readers have no opportunity to see my quote in context, which was a post called The Evolution From Linear Thought To Networked Thought. There are other links in the online version, so additional links may be added before it goes live. But most print publishers have no editorial process in place for converting print content to web content, e.g. putting in links, which leads invariably to a frustrating web user experience. If publishers want to maximize value on the web, they have to put the web first every time — that means you can’t just take what you create for print and dump it on the web, regardless of the cost efficiencies, because you’re destroying value for web users. If a user can’t find what they want going straight to your site, the next time they are going to go straight to Google — and Google will capture the value of that content distribution. But this story has one last delicious drip of irony. Nick agues in the Atlantic article, with his usual brilliance, that Google and digital media is actually changing the way we think — to our detriment. I agree with Nick that the way we think is likely changing, which is what my post was about. But I don’t know that I agree with Nick’s pessimism that the change is for the worse. Yet the way I’m quote in the article, it leaves open the possibility that I agree with Nick that the change is negative. What I’d be most curious to know is whether online reading actually has a positive impact on cognition — through ways that we perhaps cannot measure or even understand yet, particularly if we look at it with a bias towards linear thought. If anything is making us dumber, it’s that we’re betwixt and between old modes and new modes of both information and thought. The irony of The Atlantic’s print article is that by bounding the reader into a box where they can’t seek more context, and worse, by being the antithesis of the digital media experience that Nick describes, it becomes irrelevant to its own thesis. Fortunately, if you take my quote from the print article and put it into Google, you can find my post — and the missing context. I’d say in this instance, Google actually made me smarter. If publishers followed Google’s example, they’d be smarter, too. Lot’s of people are now discussing Nick’s article — although mostly they are discussing the CNET post ABOUT the article, because the article itself is not online — I’m guess Matt Asay is a print subscriber, who couldn’t wait for the article to get up on the web to start talking about it. 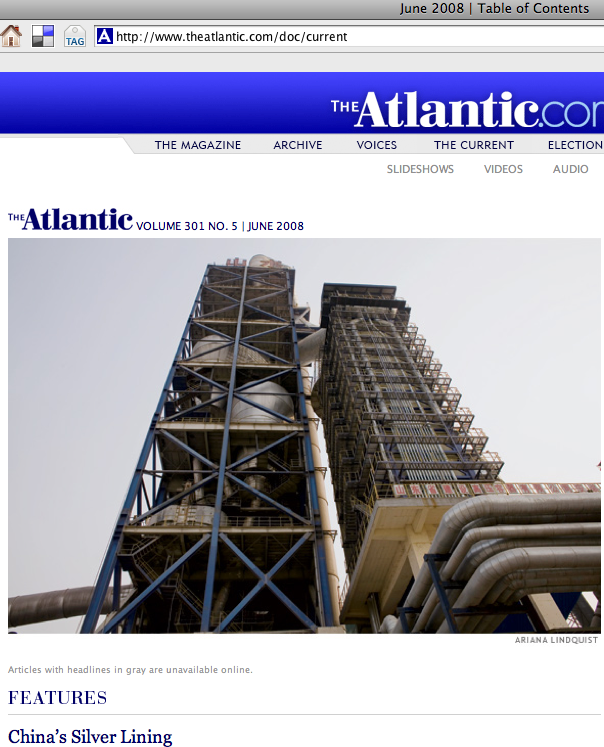 You can find all of The Atlantic’s July/August 2008 issue content indexed by Google News here, which is how I got the Google alert. You can embargo the newsstand, but you can’t embargo Google, which is the new newsstand.